Only the 4th player to earn double digit bracelets. 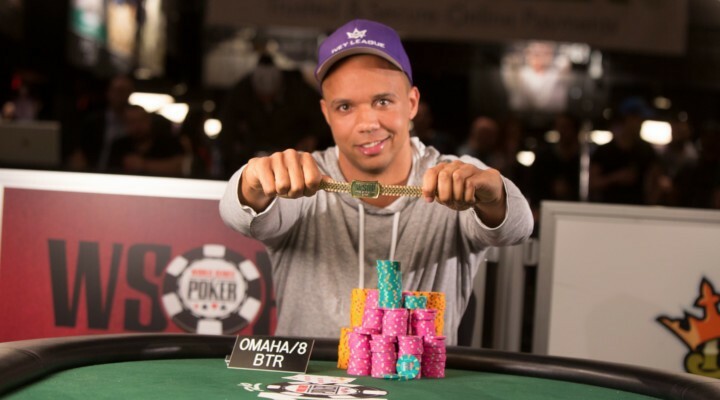 The history making 2014 World Series of Poker found itself writing storybook headlines again last night when The People’s Champ Phil Ivey went on to take down Event #50, the 8-Game Mix, and claim his tenth career WSOP bracelet and the $167,332 first place prize. Ivey becomes the first non-WSOP Main Event winner to achieve double digit bracelet victories and only the fourth person in history to do so. In terms of the bracelet leaderboad Ivey is now tied with poker legends Doyle Brunson and Johnny Chan with 10 and sits 3 behind the overall leader, which, of course, is the Brat himself, Phil Hellmuth. According to the guys at WickedChops Poker, six of Ivey’s bracelet wins are post 2004, after the Moneymaker poker boom, and is currently the most in that time span. Whoever runs Phil Ivey’s Twitter account even graciously took time to tweet a little bit of thanks to all of Phil’s supporters. In addition to earning victory in the event, Phil also helped himself and pal Daniel Negreanu (who finished 9th in this event) make good on their, now famous, even-money bracelet bet. It was only mere moments after Ivey won that Negreanu declared that it was his intent to collect on that bet ASAP. What’s the lesson the poker community takes away from sweating it out against Ivey and Daniel this summer? Bonus: Watch Ivey talk with PokerNews about his smooth path to victory and how not all of the Ivey Stories are told in truth!